Gov. Gretchen Whitmer and legislative leaders eager to boost Michigan’s economy, roads and schools are likely to get an earful from new members of the House and Senate. Lansing welcomed 46 new Representatives to the 110-member House last week. Change was even more dramatic in the Senate, with 30 of 38 members new to the chamber, with seven entirely new to legislating. That’s a nearly 80 percent turnover in the Senate — the largest legislative turnover in the country. Two professional groups certain to wield influence have backgrounds in business and education. The Legislature now has at least 42 members with experience as business owners, most of them Republican. And 22 legislators come from teaching or other education jobs (13 Democrats, nine Republicans). That bodes well for their ability to influence legislation with bipartisan promise: Providing a smooth career path to skilled jobs. Support for small business. Or raising the bar on student achievement. “Your philosophy tends to match your career path so it’s not surprising that there would be more teachers as Democrats and business owners as Republicans. That’s just natural,” said John Truscott, president of Lansing-based public relations firm Truscott Rossman and a former press secretary for two Republican governors. Organizations that represent educators and business interests such as the Michigan Education Association and the Small Business Association of Michigan recruited candidates to run for office this past election cycle, and the new class of legislators reflects the fruits of their labor. Fifty members of the House and Senate have never served in the state Legislature. That’s a high number of newbies in both chambers, even in the era of term limits. Senate leaders say there will be learning curve, but they aren’t concerned that a lack of Lansing experience will hinder their work. To the contrary. “I’m looking forward to their innocent questions and innocent inquiries adding to the richness of the experience for all of us. I think it’s great,” said Senate Majority Leader Mike Shirkey, R-Clarklake. The capitol is no stranger to the legislative shuffle: Due to term limits, legislators are pushed out of the job after eight years in the Senate and six years in the House, often moving from one to the other when they’re done. Michigan is only one of six states to have lifetime term limits. And among those, it has the shortest in the country. Before term limits, Ballenger said, the most common route to legislative office was working in local government. Whether they served as a county commissioner or a local clerk, 31 members of the 100th Legislature followed that route. However, they only represent the second-largest single profession in the Capitol. The largest individual group among lawmakers: Business owners. That would seem to be heartening news for Whitmer, who promised in her campaign to help small businesses grow by making it easier for them to receive investment and attract skilled employees. Whitmer also campaigned on increasing paths to the skilled trades, which one policy expert told Bridge is “lower hanging fruit” for legislative agreement given past Republican support for such policies. Michigan’s economy has been rebounding for nearly a decade. Jobs are plentiful and the state’s metro regions are thriving economically. But experts also told Bridge this growth hasn’t resulted in more cash for people across the state, that the educated workforce is shrinking, and it’s possible there is another recession on the horizon. 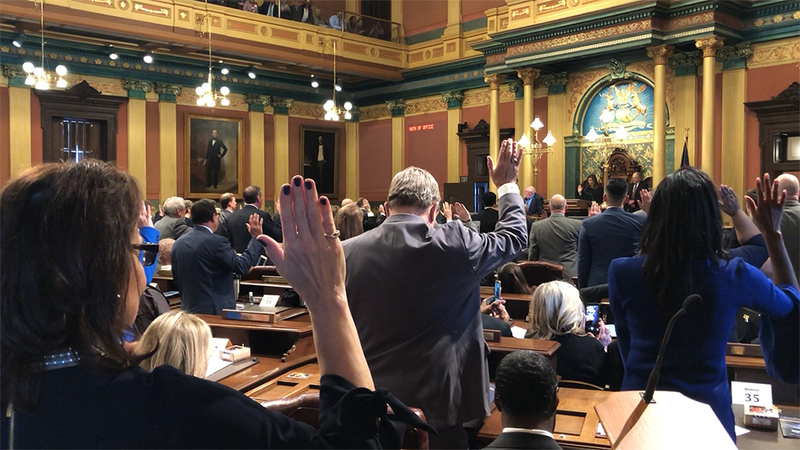 Michigan’s 100th Legislature also has 22 teachers, professors or school administrators who say they’re eager to leverage their classroom experience to shape state education policy. By most measures, Michigan’s education system is struggling. Michigan ranks 35th in fourth-grade reading skills and students’ fourth-grade math scores in 2018 were the lowest they’ve been since 2003 when they began taking the test. The state ranks last in the Midwest in every category measured by the National Assessment for Educational Progress. Many Democrats, including Koleszar, have said they want to increase funding for public schools, which may align with Whitmer’s hopes to end the practice of using some K-12 school dollars to pay for colleges and universities. Don Wotruba, executive director of the Michigan Association of School Boards, said the increase in educators in the legislature is a trend he’s seeing around the country. Having people with education experience in the legislature, regardless of party, “leads to more informed decision making” on school policy, he said. Criminal justice and veterans affairs advocates may also have friends in the new legislature, which boasts 12 law enforcement or military alumni across both parties. Republicans in recent years have looked for opportunities to save state money by reducing the prison population, while Democrats and Whitmer have expressed interest in the similar goals, driven by concerns about criminal justice equity. But while there are many commonalities between the parties’ backgrounds, there are some clear differences — the Republican caucuses are more likely to have farmers and people who have worked in finance among them, while the Democratic caucuses have more experience working as community organizers and with unions. Professional experience is lacking on some hot-button issues: Shirkey and House Majority Leader Lee Chatfield, both Republicans, vow to tackle auto insurance reform this term, but they’ll have the help of only four legislators across both parties with experience in the insurance industry. Whitmer promised more protection for the environment and to make healthcare more affordable. Eight legislators have experience working in healthcare industries, which includes two doctors. Only three legislators, all Democrats, listed previous experience working in environmental policy. While the diversity of lawmakers’ backgrounds brings a wealth of experience to legislators’ policymaking this session, by far the biggest change is the number of women serving as Senators and Representatives. There are now 42 women in the state House of Representatives and 11 in the state Senate, 15 more collectively than the last Legislature. Women now comprise 36 percent of the seats — a jump of more than 10 percentage points. Democratic House Minority Leader Christine Greig said President Trump was the “lightning rod” that got people paying attention to government and prompted many women to run for office in 2018. She said research indicates women tend to pass more bills than their male colleagues. There is a growing disconnect between public sector and private sector attitudes, policies, and values. I think it will only benefit our legislature to have more private sector representation by those who have "walked a mile in our shoes". The private sector is founded in fiscal responsibility. If we spend more than we take in, our business DOES NOT survive. It is so easy to spend someone else's money (taxes) when you don't see the limited resource that it is. Our legislature must learn how to make do with less and make the hard choices between what they WANT to spend money on, and what they NEED to spend money on. I'm sure they will have a full plate to start, but I would hope they would set aside some time to re-visit some of the policies/bills Snieder and his team rammed through without proper votes. Some should be recinded, especially since many time a proper vote did not occur. It was documented by Rachel Maddow at one point. He labeled them all "emergency" bills. They all need to be gone over and dealt with so we can move on. I wish they would but since the lame duck was widely seen as a last minute GOP power-grab and the House and Senate are still Republican controlled, they have very little incentive to revisit.